Keysight Technologies is the market leader with over 75 years of experience. The leading Keysight 89600 VSA Software is a comprehensive set of tools for demodulation and complete vector signal analysis. The software tools allow users to explore every facet of a signal and optimize designs, measure a broad range of signals including 5G, IoT, radar and more, and gain greater insight in frequency, time and modulation domains. 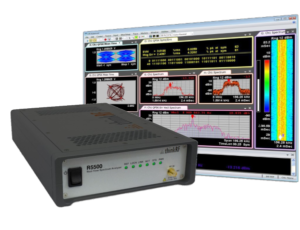 The ThinkRF R5550 Real-Time Spectrum Analyzer integrates seamlessly with the leading Keysight 89600 VSA software for complete vector signal analysis in a low-cost, flexible, and remotely deployable solution. To learn more about the ThinkRF R5550 analyzer and ThinkRF E300 Enabler, Contact Sales. To learn more about the leading Vector Signal Analysis software from Keysight, visit their website.